This month I interviewed Zach Stoller, a very exciting elementary art teacher and the man behind the Thomas Elementary Art blog. Based in Ohio, Zach is finishing up his ninth year teaching art at the elementary school level. His inspiring blog ambitiously attempts to showcase every project that he has taught, along with a printable lesson plan. You can also check him out on Instagram (@thomas_elementary_art) and Twitter (@gtes_art). Zach, I really love your blog and visit it often. I have taught several of your projects over the years, and one particular standout is the inspirational quote prints where students design a poster containing an uplifting or motivating phrase. During this project, students learned so much about typography, the letterpress, and visual communication in general. About a week after my fourth graders finished this project, they were asked in their homeroom classes about various careers that interested them. The next day in Art, I overheard one student share with a friend that she wanted to be a graphic designer when she grew up. This moment was so rewarding for me, as I really believe it is important to expose students to a multitude of creative modalities. Growing up, I didn’t know what graphic design was until I was a high school senior and someone from a nearby university came to art class to talk about career options. Anyways, your program seems to intentionally touch on the multitude of artistic fields and approaches out there--whether students are creating logos or designing buildings with a 3D printer. How does this fit into your teaching philosophy? Has this emphasis always been there? My teaching philosophy is constantly evolving, but, at its core, revolves around promoting creativity and a love for art. I incorporate many things I’m passionate about and take every opportunity to promote student interests as well. Like you, I didn’t know much at all about art related careers until late high school and college. I graduated from Columbus College of Art & Design and it was there that I realized how many art careers there truly are. In my class, I work at building skills and creativity in the younger grades and, by third grade or so, start talking more about art careers. By 5th grade, the entire curriculum is based around art careers. I have found that 5th graders are especially self conscious about their artwork, so through the years, I moved to lessons that shift emphasis to mastering new skills that don’t necessarily have a strong root in perfect drawing or painting. This is where art careers have fit so naturally for me. I have taught lessons through the lenses of graphic design, toy design, architecture, animation, interior design, and many more art careers. The 5th grade year typically culminates in a lesson in which students design their own project based upon a career in art that they’re most interested in. Ultimately, what it comes down to for me, is that my students are engaged, learning, growing, and enjoying making art. I think if most people heard 3D printing and school in the same sentence, they would think high school or college, but you have successfully integrated it into your elementary level curriculum. The results of your fifth grade architecture unit are simply outstanding, and offer students an unforgettable experience. Can you describe your path in how you became interested in this technology, how you got your hands on one, and how you implemented it? If you would have asked me four years ago, I would have had the exact same thought. One thing my district has improved in over the last several years is giving art teachers more time to meet with each other to exchange ideas and have elementary art specific professional development. At one such meeting, a fellow art teacher mentioned that he had gotten a 3D printer for his classroom. I was initially blown away and, honestly, pretty jealous! I didn’t know exactly what an art teacher would do with a 3D printer, but it just sounded cool. As I thought about it more throughout the year, I realized all of the artistic possibilities that it could unlock. I then realized the cost and had to think about it for a while longer. In the end, I wrote a grant and did some fundraising of my own in order to purchase the printer. I got it toward the end of the year two years ago and spend the spring learning how to use it along with 3D design software. Luckily, the software I use is absolutely free. It’s an online program called Tinkercad that is a simplified and very student friendly CAD design program. I began teaching 3D design with my 4th and 5th graders last year and kept the lesson pretty wide open. I had some really outstanding work as well as some projects that weren’t as resolved as they could have been. A lot of that was students struggling with a combination of new technology and too many choices. With a year under my belt, I’ve narrowed the scope of the my lessons this year. 5th graders studied architecture and community and each of them created a building. 4th graders designed pencil toppers. So far, the architecture has been outstanding. I’ve been printing the work from 5th grade for about five weeks and I’ve been really impressed by the quality of the designs. The final buildings will be put together to form an entire 3D printed city. I can’t wait to see how it all looks together. I will also soon begin printing 4th grade work. Look to my Instagram feed and blog to see more about it. You also often incorporate concepts in your lessons that are being taught in the students’ homerooms. The “machine brain” project is one of these. Do you think it’s important for art teachers to collaborate and make these connections? Collaboration can be incredibly powerful. Incorporating ideas and knowledge from a wide range of subject matter into my art lessons is important because it ultimately leads to better thinking and student work. It’s all about student engagement. You’re always going to have those students who are totally into a project to matter what it is. There are also students who may not be as interested in the “art” part of an assignment. Incorporating something that students are learning in their academic classroom immediately brings a depth of background knowledge and engagement to a project. 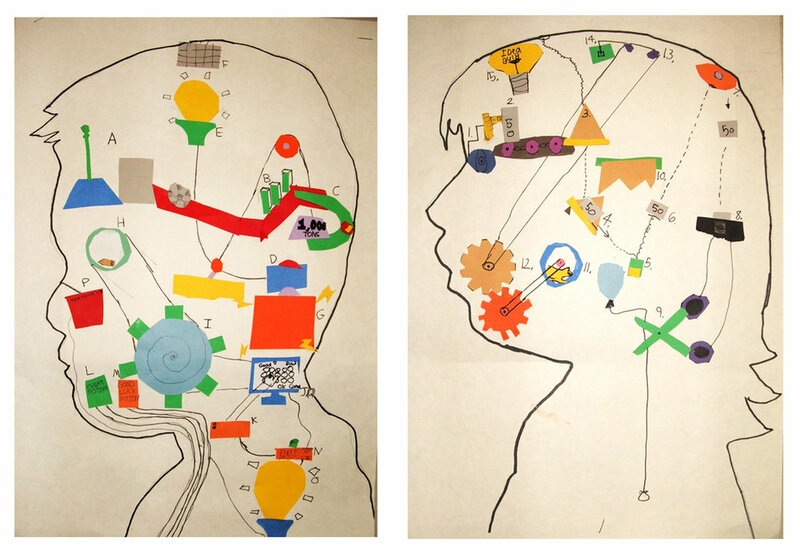 The machine brain project is a great example that started with a similar idea from a colleague, grew into collaborative work with a 3rd grade teacher, and was bolstered by some artwork examples by Rube Goldberg. Multiple parts combined together to make a truly engaging lesson that students look forward to all year long. How and why did you become an art teacher? Becoming an art teacher was not the most direct path for me. I always loved art while I was in school and, by the end of high school, had decided to attend Columbus College of Art & Design with the intention of becoming an illustrator. While I was at CCAD, I was an RA for a couple of years. Part of that job involved mentoring freshmen students and helping them through that very difficult first year. I really enjoyed that aspect of the job. At the same time, the realities of being a professional illustrator were beginning to become very real. It’s a job that requires very odd hours and uncertain financial stability. I don’t have the personality that deals well with uncertainty. Teaching runs in my family. My mother was a teacher for 35 years, my aunt was a teacher, and my brother became a teacher as well. I decided to look into getting my teaching certificate after graduating with my BFA from CCAD. I was accepted into the art education Master’s program at The Ohio State University. From there, I subbed for a year and a half before being hired into my current position as an elementary art teacher with Dublin City Schools in central Ohio. Had I chosen a different career coming out of college, I would have probably wound up in the design field. If I would chose now, it would be something to do with things I do for fun in my spare time. I have built many furniture pieces for my home and I really enjoy cooking and food. If I picked a different career now, I would would be a carpenter or a food writer. Keep at it. Find a good mentor. Make friends with the secretaries and the custodian. I remember my first year being a constant struggle to keep up with everything. Building relationships within the school is huge in that it allows you to have resources to help you along with questions or problems that you’ll inevitably encounter. If you have a good support system, everything else will fall into place. There is an amazing online network of art teachers who go out of their way to share ideas and help teachers who have questions. The first year can be tough, but you learn a lot and there’s plenty to enjoy along the way. I follow quite a few teachers through blogging and Instagram. Two that are particularly inspiring to me are Hope Knight from Mrs. Knight’s Smartest Artists and Don Masse from Shine Brite Zamorano. I’ve commented to Mrs. Knight before that I feel like we teach in a very similar manner. She brings in a lot of outside influences to her lessons and does a lot of very unique projects with her students. I’ve definitely adapted a few of her lessons to use in my classroom. Don Masse is another elementary art teacher who is doing some amazing work with his students in sunny San Diego. Don takes quite a bit of inspiration from lesser known practicing artists. Tattooed quilters aren’t the typical source of elementary art ideas, but he manages to gather sources that translate into some outstanding student work. Don is very visible in the art ed online world between his blog, Instagram and Twitter. He’s constantly sharing new ideas and it’s obvious that he’s passionate about art education. I definitely make my own art, but not quite as much as I’d like at the moment. With two young girls at home, my time can be a bit limited. As I mentioned earlier, one artistic outlet is designing and building furniture. I built a dining table recently that includes inset letterpress typography. I also have a pottery wheel at home and I throw whenever I can. Finally, I get into some illustrative work from time to time when I feel like getting into painting. This is a tough question to narrow down. If I don’t like a project, I develop something else I like better, so I like pretty much everything I teach. In the end, both of my all-time favorite projects are 4th grade projects. They happen to be animal portrait reduction printmaking and totem poles. 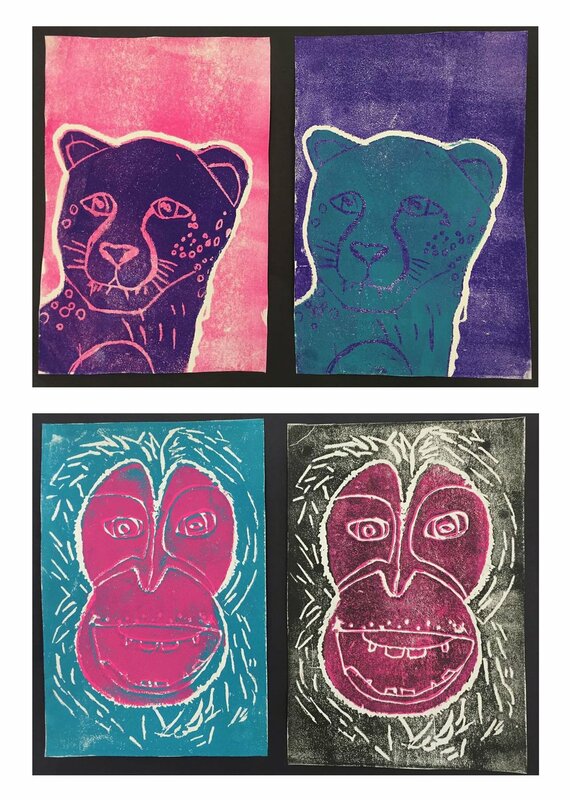 The reduction printmaking project results in a three color print for my 4th grade students. The project leans heavily on drawing skills combined with students’ prior knowledge of printmaking. The project is difficult and requires perseverance, but results are absolutely beautiful. The totem pole project is also an extremely challenging project. It pushes students to think and draw in an entirely new way. I’ve taught this lesson for many years and it’s evolved over time. It began as a painting project and has evolved into a collage lesson simply because the material lends itself to clean, graphic lines. One of my favorite parts of the totem pole project is having students compare their initial sketches to their final work. They grow so much in a few short weeks and their work really shines as a result. What role do you think technology has in art education? This may sound odd coming from a guy who has a 3D printer, but I think the role of technology should be limited. I don’t think most Americans use their hands enough. Hearing an adult say, “I can’t even draw a stick figure,” is like nails on a chalkboard to me. I want my students to grow into adults who have faith in their skills. My students spend the vast majority of their time using their hands to create artwork. As they get into higher grade levels, I do introduce some aspects of technology. Obviously 3D printing is a technology I’ve embraced. I have also taught stop motion animation and video game design using Bloxels. I use technology to expand students ideas about what artists can do, but I still spend much more time teaching traditional art techniques. Do you think assessment is important in the art room? How do you do this? What is the ultimate point of assessment in the art room? To me, it’s having students understand what they’re doing well and what they can do to improve as artists. I don’t think elementary students should receive grades in art. I don’t emphasize grades in my classroom and many students don’t even know they get a grade for art. I have found that the most effective form of assessment for me is informal. I believe that I find out much more about a student and his or her work by having a one-on-one conversation than I ever could by just looking at the work by itself. Personally, I’m at odds with the way my district structures formal assessment. I’m required to give grades based upon state standards. I get that. What I’m not allowed to formally grade is effort and participation. To me, effort and a willingness to try new media and techniques is far more important than achieving every state standard. There are so many. What it comes down to for me are those little times when I feel as if I’ve made a difference. It can be an Aha! moment from a student who has struggled. It can be a note from a student telling me how coming to art is the best part of the entire week. It can be students beaming with pride as they show their parents their work at the art show. The most rewarding times are the little things and simply knowing I’ve positively impacted the life of a student. What were the biggest challenges you encountered within this profession and how did you navigate them? My biggest challenges have been things I have no control over. My district is growing and my student population has gone up by several hundred students. Related arts time has been shortened as a result and I’m not able to spend as much one-on-one time with students as I’d truly like to. I have worked to streamline distribution and cleanup of materials to maximize the amount of time students have to create artwork. I realize that there are some things that are simply out of my hands and I try to focus on the parts of my job that I can control. What are your views on choice-based art education (TAB)? It’s funny you ask. I wrote an entire blog post last year about this exact topic. TAB and choice art are currently a pretty big trend among elementary art teachers in my district. There are 12 of us and half are currently using some version of TAB or choice. What I’ve noticed from the work of the students who are in a TAB room is that they do a wonderful job of developing ideas and their artwork is very meaningful to them. At the same time, the technical qualities of the work are typically pretty lacking in my opinion. Coming into this career with a BFA, I put a pretty big emphasis on skills. I’m currently working to raise money to switch out some of my furniture in order to move to a flexible seating model next year. I try to allow as much freedom and choice within a project while still making sure students are growing as artists. I totally get TAB and I love some of what it allows students to accomplish, but it just doesn’t work with my style. From general observation, what do you think is missing from a lot of art classes these days? Time. There is such a massive nationwide emphasis put on reading, math, and testing that I feel like the arts have gotten a bit lost. My time with students has been reduced from 50 minutes every four days to 45 minutes. I think most art teachers feel similarly. To put it in perspective, I only see each class about 42 times per year. That’s 1,890 minutes (if the class is on time) or 31.5 hours. It’s the equivalent of one week of school. We put an entire year’s worth of learning into a week. I know about 750 kids who would love to have more time. The most exciting trend to me is how connected the art education community is. When I was student teaching back in 2006, there were a handful of sites dedicated to art ed, no blogs, no Pinterest, and no social media. I didn’t have any problems coming up with lesson plans, but I had no influence other than my own experiences. I’ll check my Instagram feed after school and I can guarantee I’ll see a few lessons that I’ll be excited about. I can keep track of blog posts I like on my Pinterest page. I can post lesson plans on my blog for others to use. I can communicate directly with art teachers from all over the world. It’s a good time to be an art teacher. I don’t know if it’s a trend, but I can’t handle little art factory art rooms. I see far too many teachers who create projects that don’t allow kids to be individuals. Kids are unique and, in my opinion, shouldn’t be art minions. This is an interesting question considering the firestorm regarding school shootings. It seems that now more than ever that all educators must focus on making school a positive environment for all students. Every art teacher has students who may struggle socially or with academics, but thrive in the art room. As teachers, we need to embrace all students and show them that we truly care. There is no one solution to such an awful problem, but the answer has to lie in positivity. It sure as hell won’t be found by teachers carrying guns. To me, the teacher knows his or her students better than anyone else in the educational system. Too many politicians place the blame for low student achievement on the backs of teachers. The response at federal and state levels has been to add more testing and take curriculum flexibility away from teachers. I haven’t ever met a single teacher who didn’t work incredibly hard to make sure his or her students succeeded. As teachers, we can only control what is happening while kids are at school. In the current climate, I believe there is far too much standardized testing. I truly don’t know how I would manage a classroom in which I had very little say about the content. It’s one of the things I absolutely love about being an art teacher. Yes, I do have state standards to follow, but they’re written in a manner that leaves ample opportunity to be creative about how I meet them. There is no answer key for teaching art. It needs to stay that way.